Just call 206-909-0654 or click here. SFP has built an excellant reputation as a quality painting contractor in the Seattle/Eastside community. 4 years of training and 15 years experience in all aspects of the painting business in Scotland, has proven to be a winner for Scotlands Finest Painter. "Jed Craig did an excellent job of painting the interior of my house! I am extremely pleased. I had five rooms, the hallways and stairway painted using several colors. He showed up every day and got the job done in five days. Jed is very easy going and never complained, even though I changed my mind about the colors I wanted a few times. 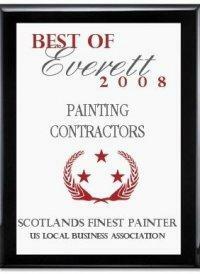 I highly recommend Scotland's Finest Painter." "Jed has been a delight to work with and has been most accommodating. His work quality is exceptional - and he made a point of putting my house back together each night as much as possible to make it comfortable for me. He was also willing to do any extras asked of him (i.e. help with re-hanging pictures, moving furniture, etc.). I was amazed to find little or no paint reside anywhere - no smears - no "over-run" onto the ceilings or other walls. A true professional. I would recommend him highly." "Jed did a first rate job on our house! We are incredibly pleased with every aspect of the job, and we can tell he takes great pride in his work. Jed will be the first one we call if we have future painting work that needs doing!" "I can't sing enough praises for Jed Craig. He was consistent, polite, honest, meticulous, and finished my painting job in a timely manner. I would hire him again without hesitation. Thanks. " "I though Jed Craig did a really good job. I would use him again. He also helped me to pick good paint colors to use and had some good reccomendations for various paints." "My wife and I were very pleased with the professional manner and the approach that they provided to us. The quality of their work performed was top notch and the relationship was a very pleasant experience. " "Great job, finished under budget and ahead of schedule. Excellent work at a reasonable price. I would choose Scotland�s Finest Painter again." "Excellent job, very clean, dependable, and very, very nice to work with. " "Jed Craig was great to work with - had the sense of what customer service is all about." "Jed did a superb job. He went out of his way and had the guy from the paint shop for an onsite consult to help find the right stain color for the deck. Very meticulous about his work. I would highly recommend him."